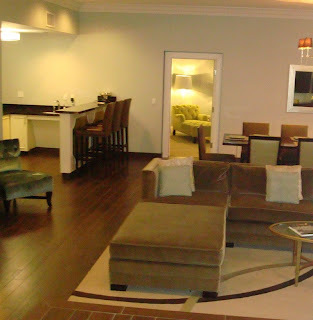 ...at which Vegas Strip resort this suite is? If so, e-mail us at TheStripPodcast[at]aol.com or leave a voice message at 206-424-4737 by March 30. [Extended cuz y'all got it wrong.-sf] This is this round of the trivia question for the podcast. One guess per person. If we draw your response from the correct answers, you get to pick anything off our prize list. That list is at the bottom of this post or in the left rail at TheStripPodcast.Com. Currently on the prize list: A free subscription to VegasMate for iPhone, Wynn resorts flash drives, an autographed copy of either of Steve's books, Knopf MapGuide "Las Vegas" or "Gay Vegas," a Ka wetnap, MGM Grand planner with calculator, Liberace Museum calendar, Terry Fator puppet or book, Cirque du Soleil playing cards, CDs from LeAnn Rimes, Ne-Yo, Jon Secada, Billy Ray Cyrus or Olivia Newton John, the DVD "How To Play Poker," the books "Quicksilver: the Ted Binion Murder Case" by John L. Smith, "Madam: Inside a Nevada Brothel" by Lora Shaner,"Kill Everyone" by Lee Nelson et al, "Skin City" by Jack Sheehan, "The First 100" edited by A.D. Hopkins and K.J. Evans, "Cult Vegas" by Mike Weatherford, "Whale Hunt in the Desert" by Deke Castleman, "Burning the Tables in Las Vegas" by Ian Andersen, "Telling Lies and Getting Paid: More Gambling Stories" by Michael Konik, "No Limit: The Rise and Fall of Bob Stupak" by John L. Smith, "Blackjack Autumn: A True Tale of Life, Death and Splitting Tens in Winnemucca" by Barry Meadow, "Tax Help For Gamblers" by Jean Scott and Marissa Chien, "Golf Las Vegas" by Ken Van Vechten, "The Killing of Tupac Shakur" by Cathy Scott, "Fish Without a Doubt" by Rick Moonen, "Mesa Mexicana" by Mary Sue Milliken and Susan Feniger, "The Art of Richard MacDonald," "Confessions of a Stripper" by Lacey Lane or "Bally: The World's Game Maker." * That brings me to the second thing. 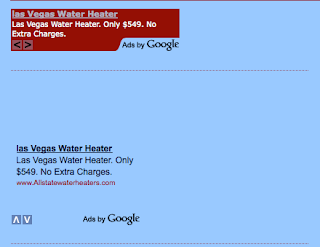 The Google Adsense ad then and right now is for Las Vegas water heaters. 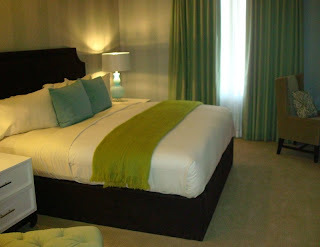 I have not blogged or Tweeted at all about my recent water heater drama. I wrote about it on Facebook and in IMs with friends. And I guess I did some Google searching the other day for more information about what was wrong with the old one and then information on installing the new one, all of which I did myself. But how would the computer know to associate me or my blog with that topic? Is Google Adsense tracking everything I'm saying in every forum and using that to advertise at me? Isn't the spooky? ...so far. Steve Marcus of the Las Vegas Sun is generally terrific, but this one shot that ran in the print edition today is just brilliant and should have run on the front page in color instead of on page 3 in black and white. It was just one of those great moments. 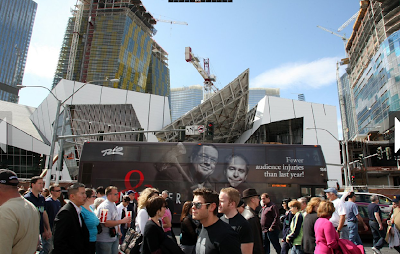 Classic.If you can't read what's on the bus, click on the photo and get a clearer view. Of course, to appreciate the irony, you probably need to read the many stories by reporter Alexandra Berzon, who recently was one of three finalists in the "local accountability reporting" category of annual honors given out by the American Society of Newspaper Editors for her dogged coverage of the construction safety problems in Vegas projects. That's pretty impressive since she's just one person and she was edged out by a team of five reporters from the Charlotte Observer and was an also-ran with a team of five reporters from the Chicago Tribune. Brava! Anyhow, check out Marcus' full slideshow of CityCenter-in-Progress photos by scrolling down on the Las Vegas Sun story by Berzon and Liz Benston on builder Perini asking its union workers to take a pay cut. 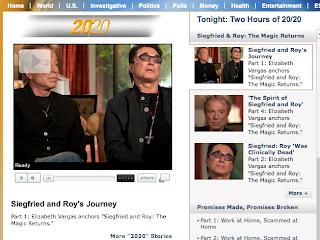 Did you watch the Elizabeth Vargas hour on "20/20" about Siegfried & Roy? Of course, we did. If you didn't, go check it out on the ABC site. It's all there, at least it is for now. * Lots of nice tribute material to S&R, reminding us of what made them unique and exceptional. Good to be reminded. * ABC said S&R sold $57 million in tickets a year. Over a 13.5-year run at Mirage, that's only $769.5 million. We in the media were told last weekend they grossed $1.5 billion. Huh? * Lots of tap-dancing around exactly what kind of couple they were, which wouldn't have happened if they had been straight and on-again/off-again involved, i.e. Sonny & Cher. But the Siegfried-goes-to-the-Greek-monastery part was fascinating and I wanted to know more about that. * Speaking of Cher, WTF? How did she land on Planet SARMOTI? By wearing more sequins? * A reasonable degree of skepticism in Vargas' voice about the "Montecore was helping Roy" crapoganza but no outside tiger experts to talk about how laughable that is. Plus, the comments from famed tiger behaviorist Stephen A. Wynn were utterly maddening. * No reference at all to the USDA's 233-page report on the incident that concluded it was, in fact, a tiger ATTACK. Also, no reference to the MGM Mirage and S&R getting the USDA to suppress the video from that night. Is it me, or is it odd that a major news network did a one-hour report on a topic and didn't cite the fact that the government did an 18-month investigation and released a massive public document on the matter? * The comments from the audience members who were at the show where Roy was mauled were interesting but not terribly descriptive. Probably could've saved trouble just by excerpting quotes from news reports at the time. * I did not doubt that it was Roy on stage last weekend but many other people did and I accepted the notion that if he was switched out I could have missed it. But the "20/20" footage confirmed that that was what I saw, that it was Roy there the whole time. And other footage showing his ability to speak and walk backed up to me that he was totally capable of doing what he did on stage. 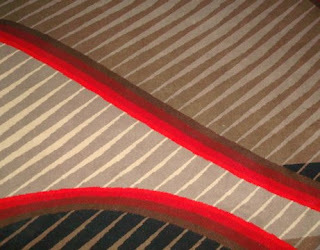 * I'm more convinced than ever that that tiger was absolutely, positively not Montecore on stage at the Bellagio, unless they call all of their tigers Montecore. Had it been the same tiger that attacked Roy, much more on that would have been dealt with in the TV special. We would've gotten close-ups of the tiger, we would've seen rehearsals, etc. Instead, Vargas added in that the cat was Montecore at the very end, as an afterthought. Anyone catch a screen cap of the parts where they said the tiger being shown was Montecore? Would still love to compare markings. * In the same vein, it was odd that Siegfried and Vargas both referred to "the cats" backstage when, in fact, there was only one animal in the performance. Not sure what that's about except that I don't know that ABC got the all-access pass that they claim to have gotten. "The following comments are provided by readers and are the sole responsiblity of the authors. The reviewjournal.com does not review comments before publication nor guarantee their accuracy. By publishing a comment here you agree to abide by the comment policy. If you see a comment that violates the policy, please notify the web editor. Some comments may not display immediately due to an automatic filter. These comments will be reviewed within 48 hours. Please do not submit a comment more than once." It may be too small to read here (click on the image to make it bigger) and I've blurried out the job and identity of the TI exec referenced here, but it's an anonymous and lewd allegation that his girlfriend is having an affair. It's at the bottom of a piece about MGM Mirage's CityCenter financing issues. I'm not providing the direct link here. Most newspaper websites DO review comments before they post them. And the R-J does so for comments to its blogs, at least. I know this because readers of this blog have complained about trying to post comments to Sherm Frederick's or Tom Mitchell's blogs and having them never appear. Someone must've dumped those. If you provide a public forum, you screen comments intermittently and someone posts something libelous such as what's been sitting on the R-J site for nearly three hours now, is the site legally responsible? I would think so. But what do I know? The LVRJ.Com folks clearly have minds brighter than mine. I'm scheduled to be on KNPR at about 10:30 a.m. PT to discuss the piece and the matter. Listen live at knpr.org or catch the podcast version later. Is this a depression yet? 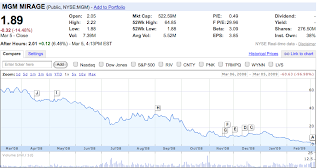 MGM Mirage is at $1.89 a share, Las Vegas Sands is at $1.99. 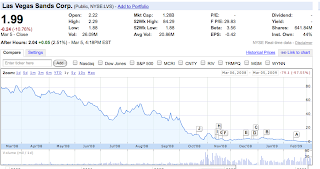 Less than two years ago, in October 2007, MGM peaked at $96.40 a share and LVS peaked at $138.93. Now what, Jim and Sheldon? In happier -- and surprising news -- the M Resort is boasting tremendous first-week business. And the Las Vegas Sun reports today they're hiring 250 more employees to handle the demand and yesterday they said 20,000+ people had signed up for their iMagine players club. Maybe Marnell has the right idea -- abandon the Strip as we know it and build a new one! 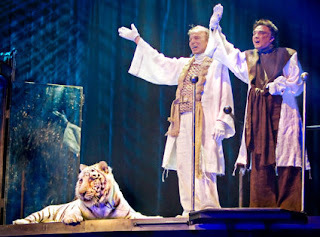 Forget for a moment whether the white tiger on the stage really was Montecore. 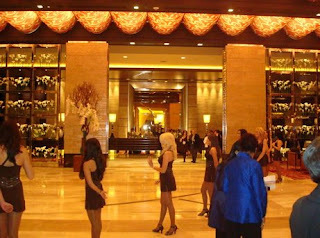 Forget whether it really was Roy Horn under the mask for the entire 10-minute performance at the Bellagio last weekend. And forget, even, that Siegfried and Roy and their managers have spent the better part of five years telling ridiculous tales about what actually happened between Montecore and Horn that awful night at the Mirage, despite the fact that there were 1,500 horrified witnesses. We’ll get back to all that shortly. But let it all go for a moment. I did. 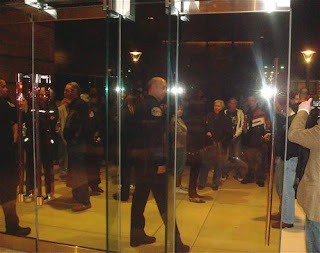 It was the only way to take in one of the most genuinely emotional events in the history of Las Vegas. Many speculated afterward that much of the show may have been fake, staged. But the awkward, bittersweet smile on Roy’s face when he and Siegfried peeled off medieval gothic masks and soaked up the adulation of a teary-eyed, standing crowd at the benefit for the Cleveland Clinic’s Lou Ruvo Center for Brain Research? That part was real. That part, when a man who was not supposed to be alive—much less ever walk or utter a syllable again—was up there enjoying a last bow? That was real. The evident and deserved satisfaction of enjoying one last hurrah after redefining Vegas entertainment and spectacle and delighting untold millions of people in their careers? What a shame, then, that there were so many skeptics. But the fault for that belongs solely with Siegfried, Roy, MGM Mirage and their handlers. It’s never easy, as a journalist, to let go of the tricky past. Those of us who covered the attack on October 3, 2003, have long memories of how this story was handled, what lines of baloney were being fed to the public and how something tragic became needlessly controversial. OK, I've been hyping the Nevada Public Radio Online auction for a few days and I do hope you all go buy my books and lunch with me there. But they just announced a pot-sweetener that is a really big deal. All auction winners get whatever they're buying PLUS a pair of VIP line passes to "any Harrah's property buffet" according to the email they just sent out. That note also shows icons and links to Paris Las Vegas, Rio, Flamingo, Caesars Palace and Harrah's. 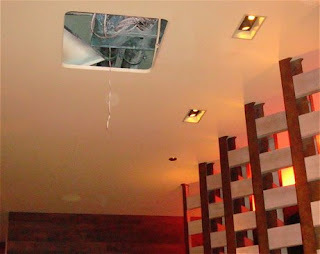 I guess they didn't think anyone would want to risk their lives at the Imperial Palace buffet? Poor, poor IP. Always ignored. No respect. But seriously, two passes at the Rio or Paris are worth about $50 right there. Do it! It's a small thing, I know. But for someone who shops online and registers for websites as much as I do, I've always wondered why they can't determine my city and state based on my ZIP code. How much time is spent scrolling through the list of states for something that ought to be automatic, right? Oh, to live in Alabama or American Samoa. Well, not really. But I'll take Alaska, Sarah Palin and all! Well, just now I was placing a bid in the KNPR Online Auction -- not telling for what, but no, it's not for lunch with myself, har har, which, in fact, I am having right now for free! -- and I had to give a new credit card. And much to my surprise, the system automatically knew that 89121 was Las Vegas, NV. That worked, too! Hooray! Now, why don't more sites do this? Too logical? I know, I know, chat people. It's been a while. We will do a show this week -- a full one that will be recorded this evening -- but we won't be providing it to LVRocks.Com for playing because we won't have it done in time. We MAY see if they can play it Thursday night and I'll be in chat for that. 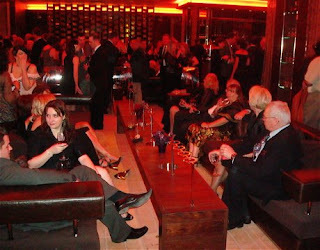 And I understand LVRocks has signed a new lease for space, so all should be back to normal quite soon. Really. 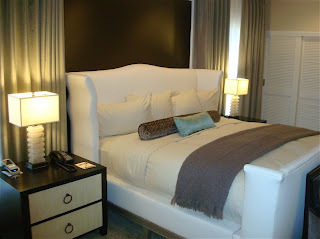 You can also read my Las Vegas Weekly column for more. 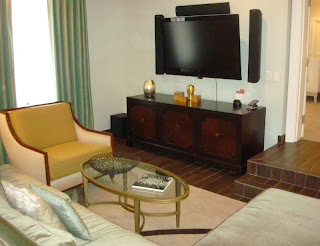 And, as promised, here are some more photos. As you can see in the video, the dancers had to perform improv numbers inspired by certain words they were given to whatever music was played for them. 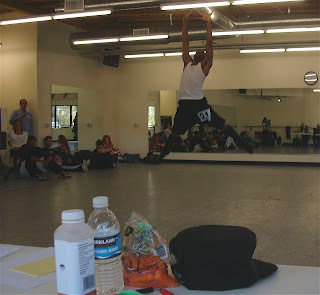 The first dancer, who is in the video, was given the word "airborne." I don't recall what the second one was told to do. 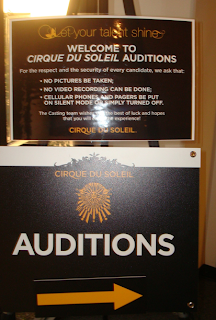 They also learned some steps of "Love" and "Criss Angel Believe" and then performed those for the casting team. 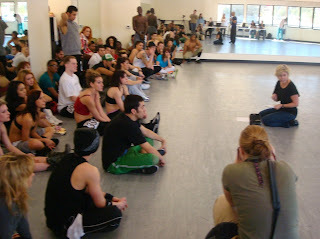 Here is Cirque casting director Krista Monson speaking to the dancers who were still in the running to be qualified for potential Cirque roles. This is the afternoon of the fourth and final day of auditions. It's 10:30 a.m. Surely by now, somebody at the Review-Journal has realized that the largest headline on the front page has a glaring error. It reads: "Stations granted extension." Who's "Stations"? Last I heard, the company that owns Palace, Boulder, Texas, Sunset and all the other locals casinos was known as Station Casinos, not "Stations." OK, so they can't correct this embarrassment in the dead-tree edition. But it wouldn't take much to fix it online, would it? Sigh. Whatever. They're probably real busy filming their publisher's next illuminating RJTV commentary. 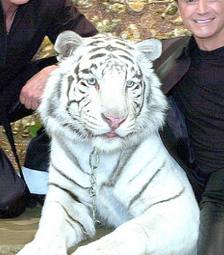 Siegfried & Roy's folks have said since Saturday night that the tiger that appeared with the duo was, in fact, Montecore, the same cat that mauled Roy in 2003. There's no real way of knowing and we had to take their word for it when we were writing on deadline. It's really hard to tell, but I can't imagine any two tigers have identical markings. So the trick would be to compare the images to determine if the markings were the same. The older image -- the only one I could find that clearly stated it was Montecore and had a close-up facial shot -- is very difficult to compare to the side view in the image distributed to the press by Curtis Dahl Photography. Anyone have any thoughts? See something I don't see? I will be watching the "20/20" report on Friday with great interest to see if there are any clues behind the scenes. 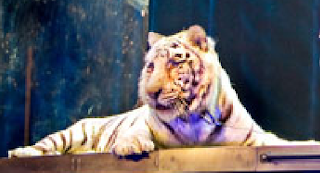 Of course, since the video of the actual tiger attack was suppressed by MGM Mirage and the USDA's investigators, there's still no way to know because ABC could be shown any big tiger and told that this was the same one. Well, it actually took four weeks, but in today's R-J, political scribe Molly Ball (and my friend, or so I hope after this...) did exactly that. The headline: "Gibbons embraces podcasts." She's not the first, the Las Vegas Sun's Charlotte Hsu also took the bait and called these things podcasts weeks ago, but Ball's sin is particularly egregious because (a) I know she reads this blog and (b) her piece was 1,500 words specifically about the use of the technology, which means her entire story was based on a fabrication and/or a misunderstanding. Gov. 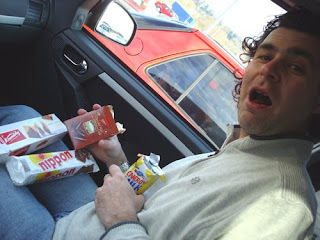 Gibbons does not podcast. And it's offensive that the Nevada media helped perpetuate this lie. The governor is recording video speeches and posting them on the Internet. That's all. His staff didn't at first offer it in a format that made it viewable on an iPod, but they at least fixed that. Yet that still doesn't make these podcasts. In order to be a podcast, users must be able to subscribe to it. Don't take my word for it. Here's the Wikipedia definition, which states: "Though the same content may also be made available by direct download or streaming, a podcast is distinguished from most other digital media formats by its ability to be syndicated, subscribed to, and downloaded automatically when new content is added." OK, so you're dubious of Wikipedia's accuracy, even though a thousand geeks would fix it in an instant if someone wanted to post something inaccurate about a topic like this. Well, fine, but PodcastAlley.Com uses the Wiki entry as its ultimate reference on the topic. And it's also basically the same way podcasting is defined in the book "Tricks of the Podcasting Masters" by Rob Walch, who co-hosts the now-podfaded interview program Podcast411. And the Review-Journal's brilliant tech guru Al Gibes trusts Podcast411 because he sent his reader(s) there nearly three years ago to get more info about the medium. Everyone who is actually involved in this technology agrees on the definition. And neither the governor of Nevada nor a political writer for the Las Vegas newspaper are qualified to redefine it. Why does it matter? Well, newspapers are supposed to care about accuracy, or so I thought. The paper's editors wouldn't allow someone to refer to a psychiatrist as a psychologist because that would be inaccurate and because there is a substantive difference between the two. Same here. And in this case, the governor is misusing an important technological term for political image, to make himself seem au courant and populist. This isn't cutting edge; politicians have been making videos and putting them on their websites for many years. Most even go the extra step of posting them on YouTube, but not Gov. Gibbons! So the story here is not that the governor is breaking into a new medium, it's that the governor is lying to the public about what sort of media he's using, either out of ignorance or on purpose. This is not a small matter of semantics; it would be like the R-J pretending it was a TV station and...oh, wait. Oops. Bad example. What's more, though, Ball's piece, despite its length, was incomplete in addition to being inaccurate. Even if this were a podcast -- which it's not! -- Gov. 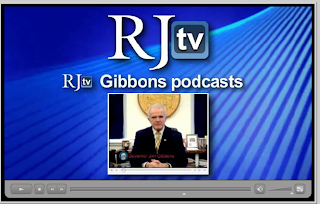 Gibbons wouldn't be the first in Nevada anyway, but you'd never know that from this story. 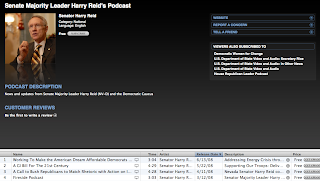 Sen. Harry Reid, D-Nev., has had two podcast feed in iTunes, one from when he was still Minority Leader way back before the 2006 election and a more recent one that offers four video podcasts -- real podcasts that users could subscribe to -- last year. So he's been in the game since before Gibbons was even elected. Newly elected U.S. Rep. Dina Titus, D-Nev., has a podcast feed that dates back to 2007, but it appears that she never really put any actual shows into it. (Those three files there appear to be test files and cannot be played or downloaded anymore.) In fact, that's all that comes up when you search "Jim Gibbons" in iTunes, probably because Titus was then running for governor against Gibbons. 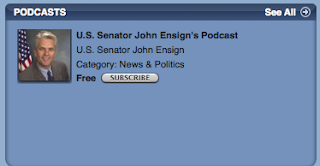 It appears that Sen. John Ensign, R-Nev., at least has a podcast feed, although you get errors whenever you try to read more or subscribe to it. 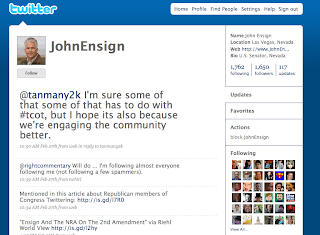 And Ball totally misses the chance, while she's in the neighborhood of new media, to note that Ensign is now a prolific Tweeter. 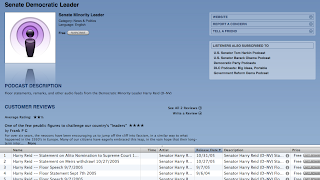 Also Tweeting: Harry Reid and U.S. Rep. Dean Heller, R-Nev. Not Tweeting? Gov. Jim Gibbons. Neither Las Vegas Mayor Oscar Goodman nor U.S. Rep. Shelley Berkley, D-Nev. have podcasts or feeds or Tweet -- too bad because God would they be entertaining -- but both have appeared on my podcast at least twice. The saddest part is, it's so easy and free to create a feed to put these files into it. It would take all of about 10 minutes. And the result would, more likely than not, be a lot more viewers who aren't going to think to go to the state site to get Gibbons' latest but would listen or watch if it came to them directly. I know I would. Technology is your friend, sir. Try it. 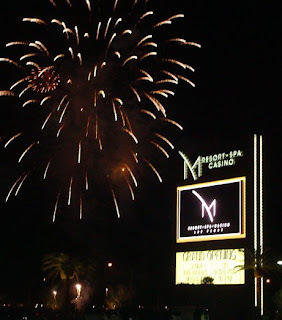 The $1 billion, 400-room M Resort opened a couple of hours ago. It's a joint venture between MGM Mirage and 35-year-old Anthony Marnell III, the son of the Vegas builder responsible for the Rio, the Forum Shops and Wynn Las Vegas. You've probably been hearing about the M Blimp for a while, a novel marketing approach. 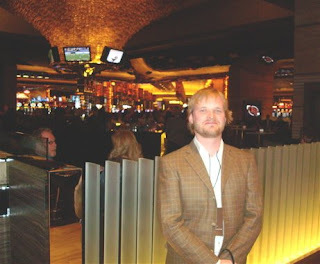 Mostly, both Hunter and I were distinctly underwhelmed by the opening-night experience as well as the interior design itself, although it is hard to compare to our last outing, Encore. 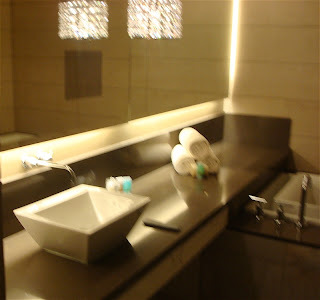 M just has lots of hard surfaces and modern-art looking objects, very little warmth. There was some sort of fire-and-dance performance out by the pool before the opening that involved choreography and the twirling of a lot of red-and-black checkered umbrellas, but it was kind of hard to see and we had good standing position. Refer back to Hunter's Twitter pix because my cam just did not cooperate for outside pool photos. That's too bad because it's the prettiest part of the joint, but it was just too dark for Ol' Cybershot. Regarding entertainment, there was a string quartet playing Muzak versions of The Who and Billy Joel in the lobby, which also seemed odd. See? Hunter wondered how long this would take to be fixed and whether it could become the M's version of the Palazzo's blue tape. My suspicion is we won't know enough people going through there to even find out. The M has some interesting touches to it. It sits about 10 miles south of the heart of the Strip along Las Vegas Boulevard, so it's really intended to appeal largely to locals in the southwestern part of the valley where there really are no casinos of significance. 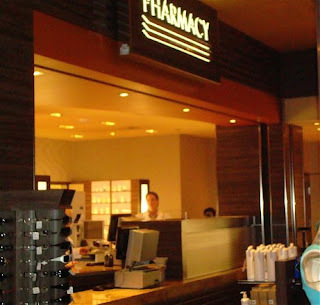 To create a new incentive for locals to come in and lose their cash, they've got a full-service pharmacy and they're having "we'll-pay-your-co-pay" promotions. I guess having casinos as community bowling alleys, pay-check chasing centers and movie theaters isn't enough anymore. Why not have a doctor's office and eyeglass shop, too? As Hunter cracked, which locals casino will be first to market with funerary services? "Madge wouldn't want us to grieve! She'd want us to keep up her life's work and try to hit Megabucks!" 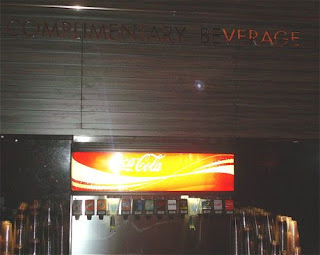 This I liked, the complimentary drink bar in the casino. We discussed this sort of thing just a couple of months ago. Hunter and I had the run of the property for four hours before the public opening. 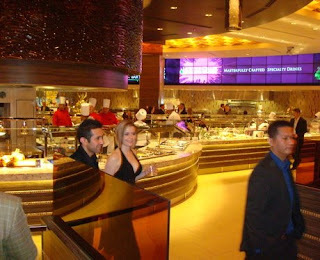 Well, we had it with about 7,000 other people, which made trying out any of the sit-down restaurants all but impossible, so we ended up at the buffet. The food was good, but the buffet spread itself was strangely and not terribly conveniently arranged. There was one long, large feeding trough that was sort of like walking around the edge of a fashion runway. It may be difficult to see what the problem is, but there's no way if you're on one side to get to the other side without going all the way around the entire thing. Odd. 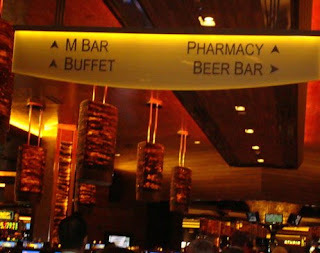 The selling point for this buffet is to be that they provide free beer and wine. An interesting idea, though I wonder how practical or wise it really is. Do people go to the end of the Earth just for free booze at a buffet? 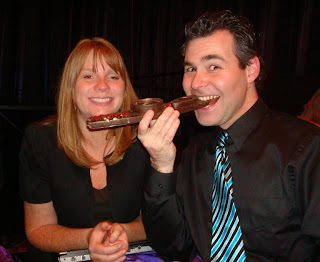 The desserts were very good, though. 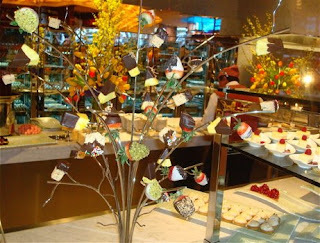 This was artistic -- little bite-sized bits of rice krispie treats and chocolate-dipped fruit stuck on skewers like a tree. 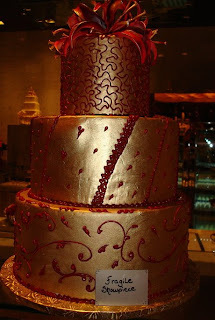 I did wonder why they felt the need to warn us that these large cake things were "fragile showpieces," as every one of them said. 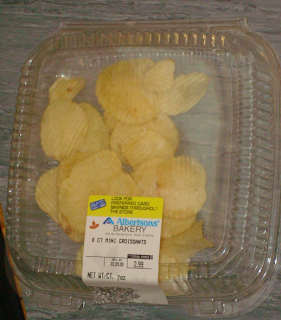 Did they think people would stick their fists in them? Or is this a pre-emptive effort to counter the impact of all that free booze? 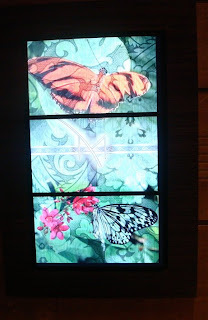 Also, didn't anyone tell the M folks that Encore has cornered the market on butterflies? I do hope this place works and I admire anyone willing to put themselves out there like this, especially in these economic times. It was nice to see crowds of locals outside waiting for the 10 p.m. opening and then to see the long line of cars waiting to get in as we drove off. It's just that I didn't leave anything way down there at M that I need to go back for. Then again, if they're willing to cover my medication co-pays, you never know, I guess.